Pick at least 4 quarts (4 litres) to make two batches of jam.We picked one basket for jam, and a second basket for eating. Try not to get carried away! There are always more berries hiding… you can’t take them all home. Jam is really easy, you just need a big pot, some Certo (pectin), and some sugar. Add rhubarb if you’d like to make a tangy strawberry-rhubarb jam. Get your glass jars out of storage (or buy a new box).I like these 2-cup jars, not too big, not too small. Wash the jars and the lids in hot soapy water. After you’ve washed your jars, put about 1″ of water in each, put on a tray, and stick in a warm oven to sterilize while you prepare the berries. Rinse berries, remove the green stems, and put a few in a big bowl.Crush in small batches with a potato masher, or a pastry blender. Measure out the crushed berries. My recipe needed 4.5 cups of squished berries. Make sure your pot is big enough for the jam to double in size while it is boiling. It’s like a scene from a movie! When the jam is cooling, skim the foam off the top with a metal spoon. If you have a funnel, it makes getting the jam into the jars just a little bit easier. After you’ve put the lids on, turn the jars upside-down for 15 minutes (set your timer). This prevents the fruit from quickly settling to the bottom of the jar. If you have any jammy questions, just send me a note. You can always reach me at Shelley@OneRoastChicken.com. “Successful Home Cooking” is selling like cold lemonade on a hot day! OneRoastChicken’s new publication, “Successful Home Cooking” is now available. Not just another cookbook, these are cooking lessons in full-colour delivered right to your kitchen. All recipes include pages of colour photography and step-by-step instructions. 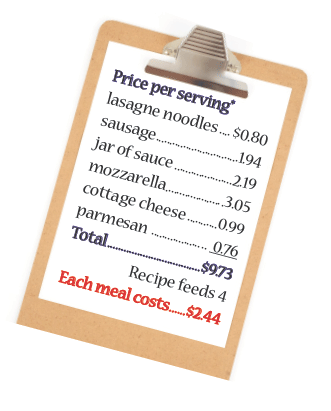 And to keep you on budget, every recipe includes the price per serving. How about Apple Pie for One for $1.23 per serving? Or Lasagne $2.44 each?